The word Cyborg, as the name implies, means cybernetic organism. When we apply this word in a small unity, it can be a semi-mechanical human; when we apply this concept in a larger realm, it can be a megacity, which hybridizes human and nonhuman in a responsively intellectual way. The appearance of the cyborg has engendered a new wave of fear and trepidation towards the invasion of the body by strange technologies that threaten to eliminate or overwhelm the human subject. It has several procedures of development. The urban metaphors of Cyborg Urbanization can range from organicist conceptions of the nineteenth-century city to neo-organicist representations of the post-industrial metropolis. This conception emerged out of a functional analogy, originating within the medical sciences, where spatial organization corresponded with distinctive arrangement of human organs. 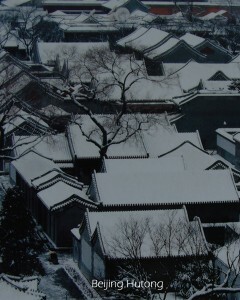 It emphasizes differentiation of urban functions. While in the neo-organicist city, the emphasis shifted to a kind of neurological reading of space as a diffuse and interconnected realm of human interaction. The emergence of the neo-organicist city is founded on the blurring of boundaries between city and human rather than repeated delineation. Imagine the body-city nexus can be conceptualized as thinking machine, and then city and human become one informational entirety with the networks of neurons that sustain multiple relationships. Furthermore, the blurring of boundaries between the body and the city raises complexities in relation to our understanding of the human subject and the changing characteristics of human agency. An extended conception of human agency would include, for instance, the role of biophysical processes and socio-cultural technological systems that impact upon the social production of space. The complexities of human agency in the cyborg city point to the intersection between technological change and the reformulation of the public sphere inherited from the industrial city. So, this new forms of distributed cognitions are creating a more integrated rather than individual system of sensory perception that directly challenges the established modern consciousness and experience. With this kind of distributed cognition the built space of the city has not only become part of the human body but has begun to impinge upon the process of thought itself. 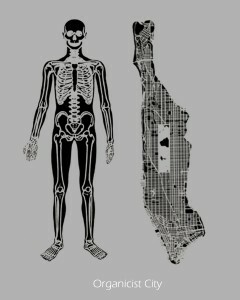 At this far, we can see the development of Cyborg Urbanization has experienced of process of changing understanding of city from material exchange to information exchange or thought exchange, thus associated with politics, economy, public health and so forth. 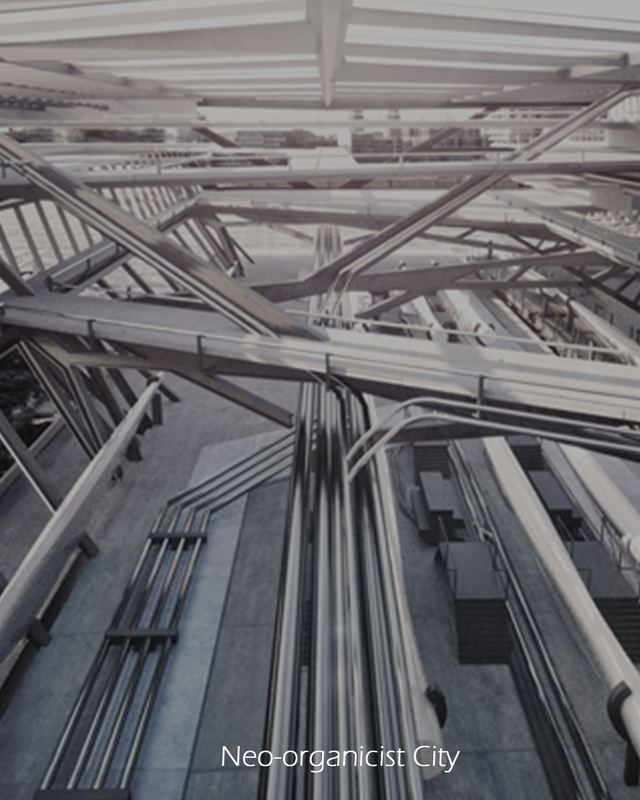 So, the cyborg metaphor allows for the simultaneity of concrete and imaginary perceptions of urban infrastructure so that the categories of the ‘real’ and the ‘virtual’ become interconnected facets of urban experience. The cyborg metaphor is, in other words, peculiarly suited to an understanding of the contemporary metropolis not only as a morphological entity entwined with various technical and aesthetic discourses, but also as an abstract and inter-subjective realm through which political and cultural ideas become constituted in parallel with the concrete development of the city. While, the newly created definition Swarm Urbanism derived from the observation of swarm inhabitation, ranging from medieval villages to Chinese hutongs. These swarm forms of urbanism constitute a relatively homogeneous field of operations, where individual components don not stand out, but conform to the pervasive logic of their surrounding environment. In another word, swarm cities are emerged in a pattern of time. So, actually the phenomenon of Swarm Urbanism is not something new, it’s about the proliferation of architectures in everyday life. With the development of the software technology, we gradually find some algorithms represent the principles of the generation of cities. But, rather than rely on the capacities of fractals, L-system, cellular automata and other system that operate largely within their own discrete internal logic, we need a multi-agent system comprised of intelligent agents interacting with one another, making their own decisions and capable of spatial mobility. So in this kind of system, we are not gonna simulate actual populations or their occupation of architecture, but rather embody a collective self-organizing urban intelligence, which remains responsive to changing situations or stimuli. There is no pre-existing collective body that we can reply on, but rahter a new stable body which is composed from the intricate connections of these disparate units. This opens up an intriguing way of understanding the relationship between humans as “agents” within this system and the fabric of the city as a form of exoskeleton to human operations. At this far, I would say the swarm urban system is a form of reciprocal presupposition between city and occupants. Over time, the fabric of the city evolves in response to the impulses of human habitation, which are likewise constrained and influenced by that fabric in a form of unending feedback loop between inhabitants and city. So, talking about the generation processes of these two urbanisms, Cyborg Urbanism derived from the panics of the scale of future cities and so much advanced city machines that made so many decisions for people. Then, people started imagine the incarnation of future cyborg cities with the emphasis on the exchange of materials, like organicist city. Then people started thinking about the anticipations and interactions of both city and people in the process of city formation. People realized city is not separated and the core underpinning the city is not material. it’s consciousness, which is shared by both people and city. In this way, the forms of cities are representations of every decision made by feedbacks from interactions between city and people, in this way, culture, politics, economy are associated in urbanization. 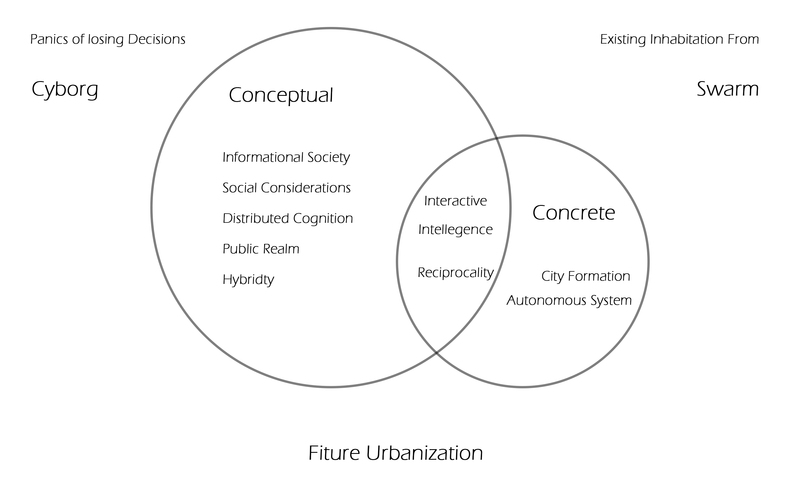 So, Cyborg is more likely to incorporate both conceptual aspects of future urbanization as well as concrete aspect. While, swarm urbanism derived from the existing forms, like colonized inhabitations. 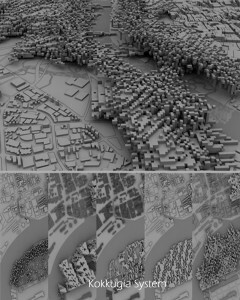 It analyzed the generative principles of cities and understood city in everyday life was emerged in a collective way of responses to environment. Then people want to find some system which can imitate this process of urbanization. But they found urbanization is a kind of movement which never stops, when inhabitants change or the culture, political background changes, it changes; when there is a impulse of influence, it mutates, vice versa. So, a system which can really inherit these characteristics should be based on none, but generated by people and city themselves, let them gradually reach an stable situation but not an endpoint, according to all kinds of backgrounds. Also, they have digital practice of swarm urbanism, that a new software called kokkugia is popularly used for urban and architecture design based on the interactive system from all kinds of components which composed the system itself. 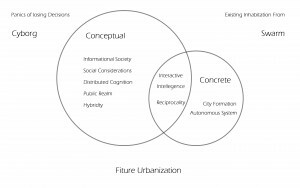 So, I would say, this two urbanisms derives from two polarities of consciousness and phenomenon, but they culminate in consensus on the interactively intelligence which decides the direction of urbanization. Cyborg concerns more about conceptual aspect, with more considerations about social elements; while Swarm concerns more about how the generative system is constructed and performed. Cyborg is more ideological, seemingly includes the theoretical part of Swarm, but Swarm is getting pragmatic and can be more comprehensive in the future.